Last week John and I were at his Dad’s house and I was talking to Hannah about her upcoming birthday party. She told me all about the pool party they were planning and the crafts they were going to make. Then I asked about the cake. Patti (John’s stepmom) mentioned that she thought about making and icecream cake (The one with ice cream bars and magic shells…. ohh I should make that soon.) But she didn’t seem too excited about it. All of a sudden a light bulb went off and she said “Nina, you make cakes!” I laughed and said I’d be happy to help. So, yesterday Hannah came over and we made her cake. 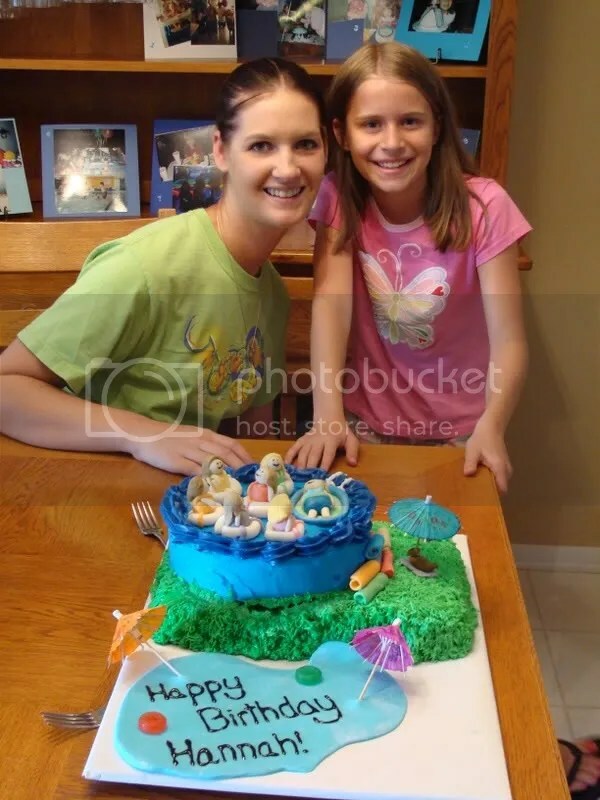 She helped with everything, mixing the batter, molding the figures, piping the grass… the entire idea was her idea too.. I just helped with technique ideas. Patti dropped Hannah off at my house around 11:30 at 5:30 we took her home with this!! 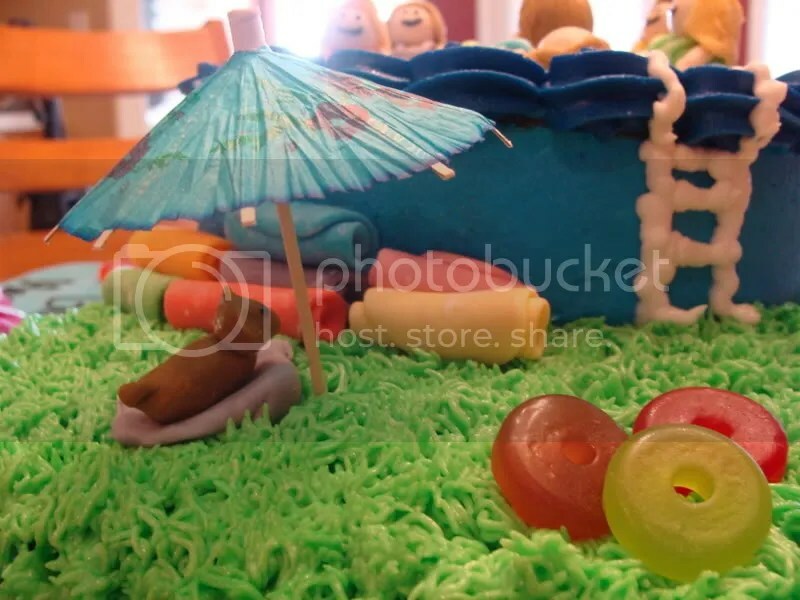 The party will be held in their back yard and will include swimming in their Blue Blob pool. There will be 7 girls total at the party (Hannah and Amanda and 5 friends). If you look close you can see the “earthquake”. The car ride wasn’t so kind to the cake. Next time I make a cake, I will definetly bring some extra icing for patchwork. But they have a big “10” candle that will go in front of the hole and you won’t even be able to see it. Here are some up close pictures. We made each little girl that will be at the pool party. 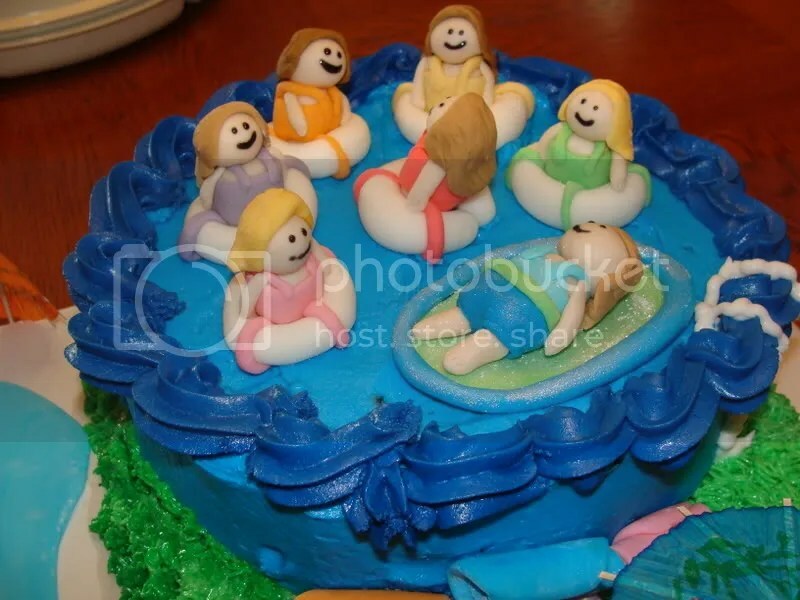 Hannah is the one floating on the raft (it looks like a raft they own) and she is sparkly since “she’s the birthday girl”. 🙂 Amanda (our other sister) is the one in pink with blonde hair. Hannah wanted to make sure it was realistic. So each girl has her own towel (in the color matching her swimsuit) waiting for when she gets out. The little dog under the umbrella is Katie, their puppy. And the little lifesavors are little rings to throw in the water and find. 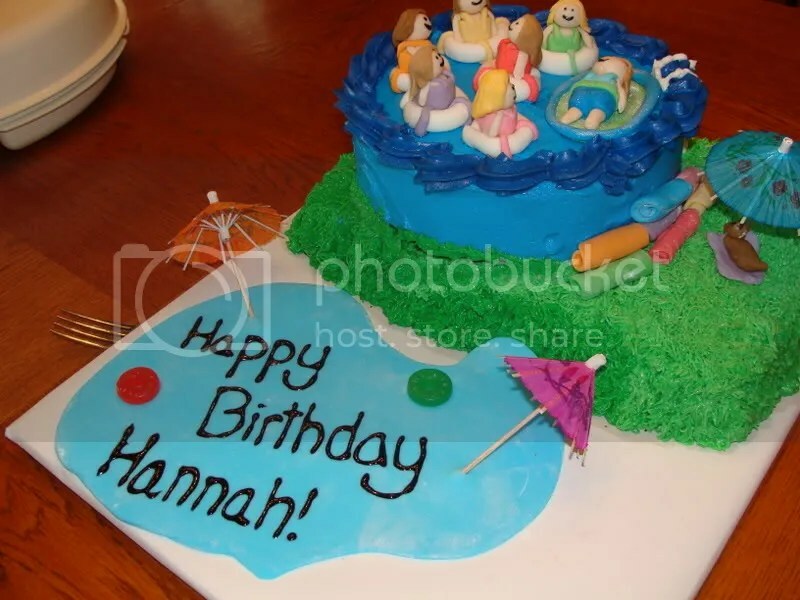 I had sooo much fun making this cake with Hannah. I think she completely enjoyed herself also. Amanda is looking forward to coming over to make her birthday cake in January. Joe also said that he wants a cake for his birthday in September…. his whole family at the beach…. we’ll see if that cake happens…..
Last night one of my dear friends came over. Last week when we were hanging out we decided that we both needed to cook more, so now whenever we hang out, we are planning on cooking. 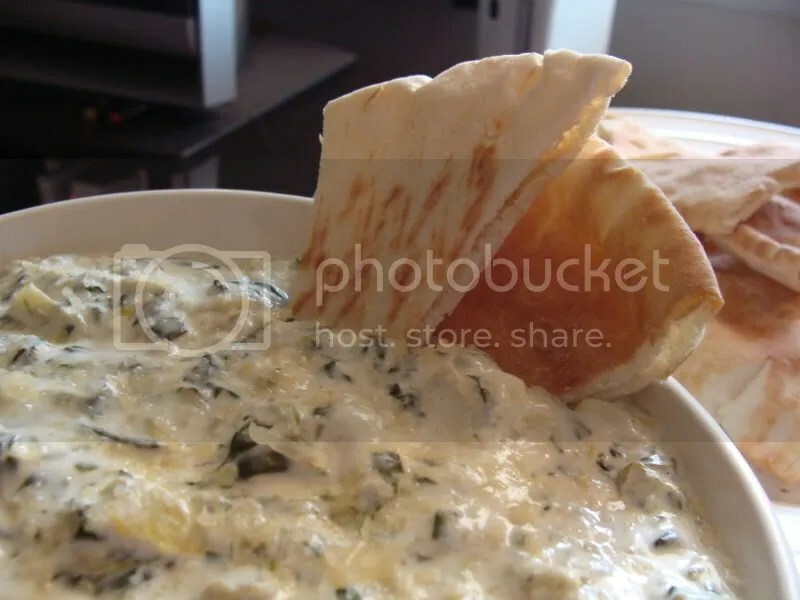 Last night we decided to make Alton Brown’s Hot Spinach and Artichoke Dip. This dip was really easy to make and was also so delicious! I think it was a little too “artichoke-y” but John thought it was perfect. We bought some pita bread and baked in the oven at 400 degrees for about 10-15 minutes so it would be crunchy. Recipe to follow. Hello out there? Is anyone still reading this? I am so so sorry for the lack of updates this past few weeks. I recently got a small job promotion which has completely limited my use of internet for blogging purposes. 😦 But have no fear! Thursday afternoon I have wonderful people coming to install internet at my house!! (IT only took a year of your constant nagging reccomending CB)Yay!! So, hopefully I’ll get back into the blogging groove and I can start updating more often. So today is John and mine’s 1 year anniversary!! I have the top tier of our wedding cake defrosting in our fridge, so let’s hope it tastes good!! I wrapped it up really good, so it at least has a chance at tasting alright. In case you want to see a glimpse of my wedding, here’s a litte highlight film that my videographer made for me. Alex Dunn did an amazing job with my wedding. If you need a videographer and are in Arizona, try him, he’s great! !